The battle of Azincourt occured on 25 October 1415 in northern France. The battle was notable of the use of the English Longbow, which Henry V., the English Army commander used in very large numbers. You are the french side under Charles d'Albert. Defend the Castle of Azincourt. This is too easy. I charged my powerful cavalry outside the gates, devastated the English army, destroyed the pavilions and stood on the spawn points until Henry V was defeated, and I won. No challenge. Also, it would be more realistic if the French were blue and the English red, respectively being the royal colours of either kingdom. Can I update a harder version? I could change the colors. Yes, please update your file by selecting the small blue button 'update' just above your file description. -The castle's range reaches the tents at the beginning. -What's the reason for closing the gate? -Your archers are stuck... I deleted the house/wall and got them out. -I think the enemies can get stacked attack if they stay on the tile. Thanks for your comments. I am aware of this things. It is a small funny game for me not a very big campaign, but thanks for any comment! "Azincourt" seems to be a deliberately misspelled entry for a minigame contest on the usual minuscule sized map. I found the game entirely too simple and straightforward while some repetitive music\audio files detracted from the experience considerably. In addition some very weird gameplay mechanics like monks that disappear are present. Mostly the game boils down to either blitzing the enemy camp with your cavalry or defending the castle by staying back and being slowly killed off with no chance. The game is very easy to beat by charging out with paladins and placing your men on enemy spawn points. Indeed, its the only way to win as letting the enemy build up will result in a massive doomball of massively upgraded longbow with huge attack boosts. Nerf the enemies big time but also make it tougher for the player to run out with some halbs and pikemen. Throw some trebuchets and catapults once in awhile to make the player choose to engage at carefully timed intervals. The game was quite simple and while some attempt at making an interesting scenario was visible the result of these weird mechanics didn't work out for the best. The gameplay mechanics are quite strange and involve the players castle being in range of a camp with only one viable strategy to win by blocking spawn ins. 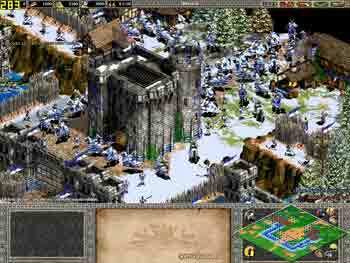 The snowy map was quite symmetrical in design, with a moat that resembled a box and large walls that obscured the base. The terrain outside was quite flat and plain. The forest had only the tiniest amount of detailing attempted. The elevation leading to the castle from the rear was odd looking like a massive pyramid. The bare minimum to explain the game, there really isn't any story present at all. Final thoughts:Not much to see here.